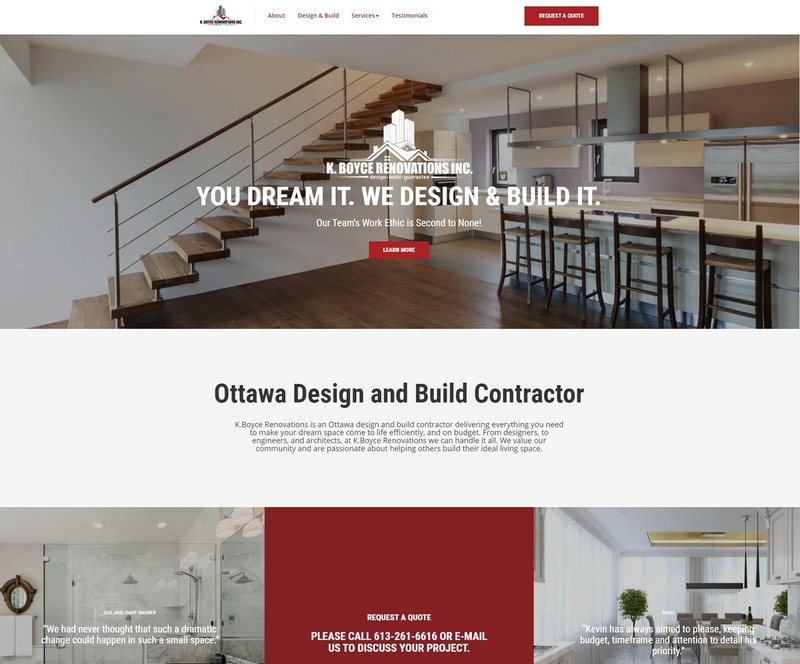 As the leader in construction websites, we must stay ahead of the curve and always look for new ways to innovate and deliver high quality websites for our clients. Part of our effort to stay innovative and ahead of the curve involves client research. 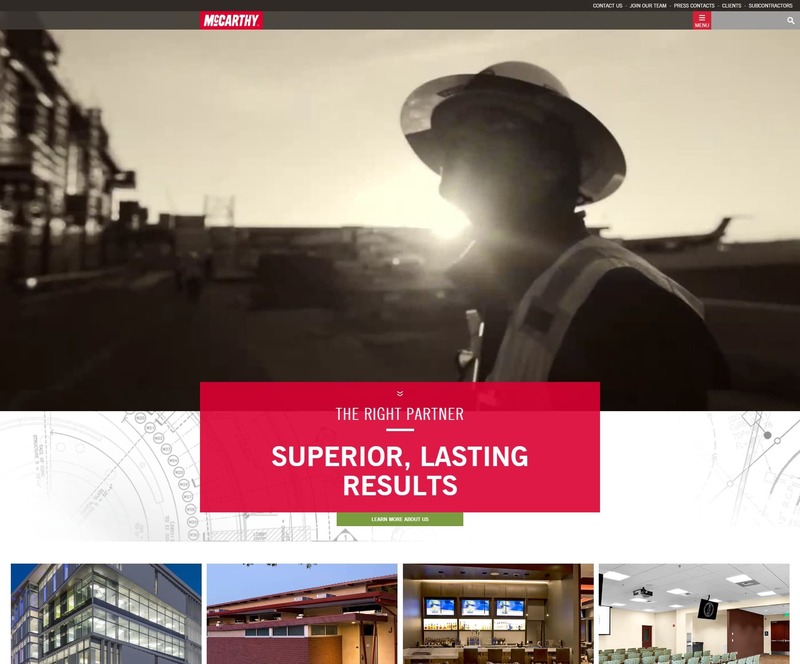 Our client research has allowed us to discover some great construction websites and we are excited to share some of them with you. We hope that these websites will inspire you and give you some ideas for your website. We polled over 500 homeowners and asked them what’s most important to see on a construction website. Remember you’re creating a website for your potential customers not yourself, so give them what they want to see. Clear, high quality photos, accessible contact information, client reviews, and background information are the top key components visitors to your construction website are looking for. By providing those elements, you offer real value to your visitors, earn their loyalty and ultimately, their business. 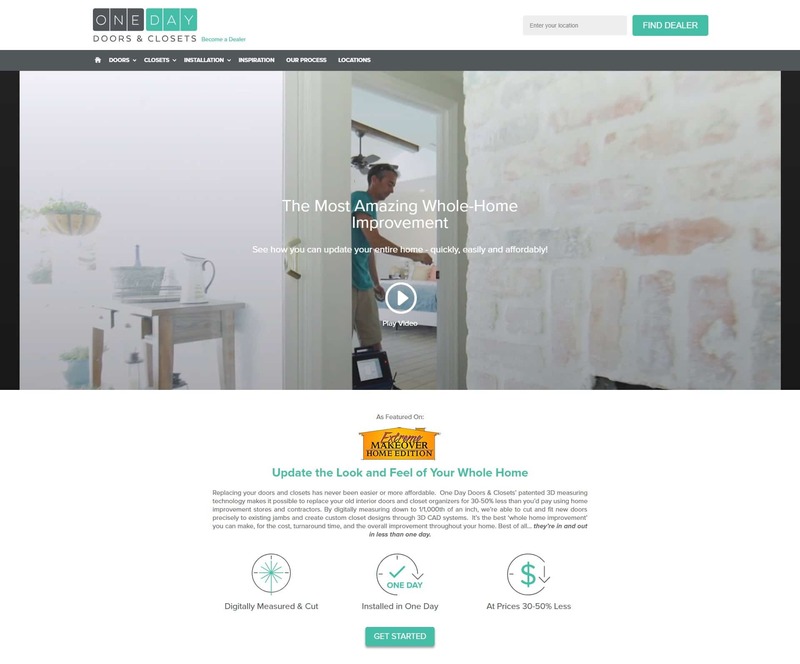 One Day Doors & Closest is a national business and their website is top notch, here’s why…. They leverage the power of video content and have a professional video to engage you on the homepage of the website. The website showcases their work with a interactive before and after photo slider. It’s easy to find a dealer in your area with multiple calls to action. They clearly present their process and how their installations are done. 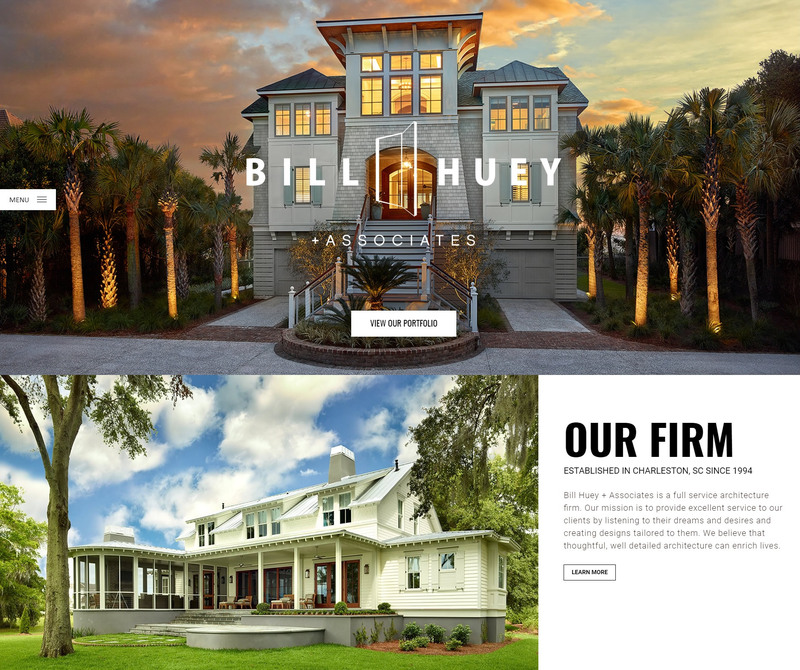 Bill Huey & Associates is a full service architecture firm and their website is visually appealing. Modern, minimalist website design with a heavy emphasis on their work pictures. They utilize professional photos of their work to showcase projects. Homepage hero slider is visually appealing with animated logo. Portfolio has project details and high quality images. 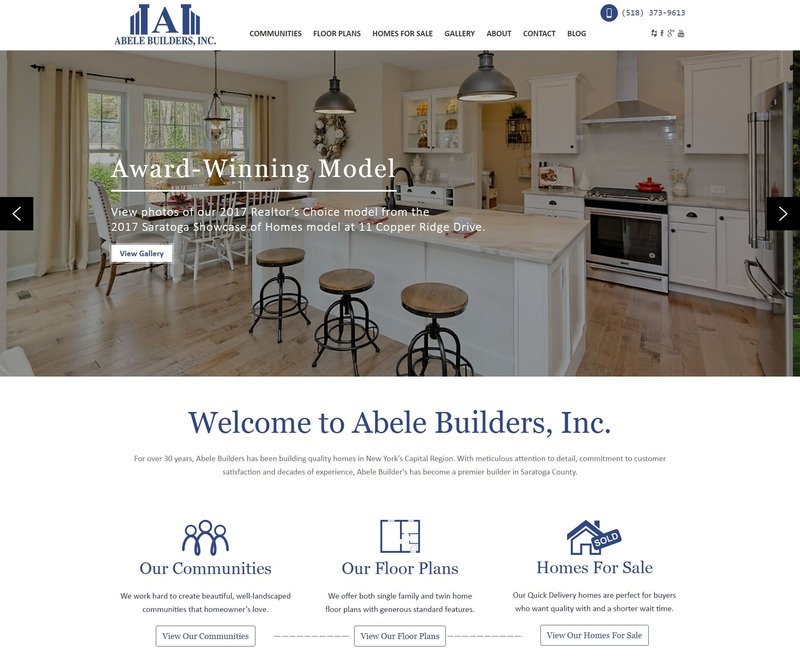 Abele Builders is an awarding winning home builder in New York. They build custom and spec homes for different residential communities. Website has a great flow to it and it’s easy to find what you are looking for. They showcase a home wizard feature that allows users to pick their home and lot and get detailed information. The floor plan pages are a great feature of this website. It showcases the types of floor plans available and the details of them. They utilize a floating sidebar navigation to make it easy to find information no matter where you are on the page. This website has great call to action with many lead forms and contact information on all pages. They clearly present who they are, what they do and their process. Focus Building Solutions is a reputable design build firm that also does interior furnishing. Website is modern with great use of visual animations. The portfolio on this website is listed by project segments and has professional photos. This website has a great careers section showcasing jobs and the culture of the company. Throughout the entire website all the pictures are professional quality and high quality. Simple call to action on the top of all pages so visitors can easily get in touch. This website has some great use of staggered design. Call to action is strong on this website with free estimate buttons throughout. Having a showroom is a big advantage to this business and the make it easy to visit their location. Contact forms on this website are simple with only the crucial information required to request information. Rob Mills is a highend architeure firm that specialize in Land, Architecture, Interiors and Living. This website is modern with a simple navigation system. On initial homepage load they showcase a short film highlighting the firm and their capabilities. This creates great engagement for the visitor of the website. They utilize a dropdown menu system to easily find what you are looking for. All the photos on this website are professional and create a strong sense of the brand. The use of font styles on this website is excellent. Contact information is easily accessed and they make it clear how to contact their different locations. K. Boyce Renovations is a design build company that does residential and commercial work. This website is really clean and simple to navigate. They feature a “Request A Quote” button on the top of all pages. The service capabilities are clear and easy to digest. Users can quickly find out how the company can help them. 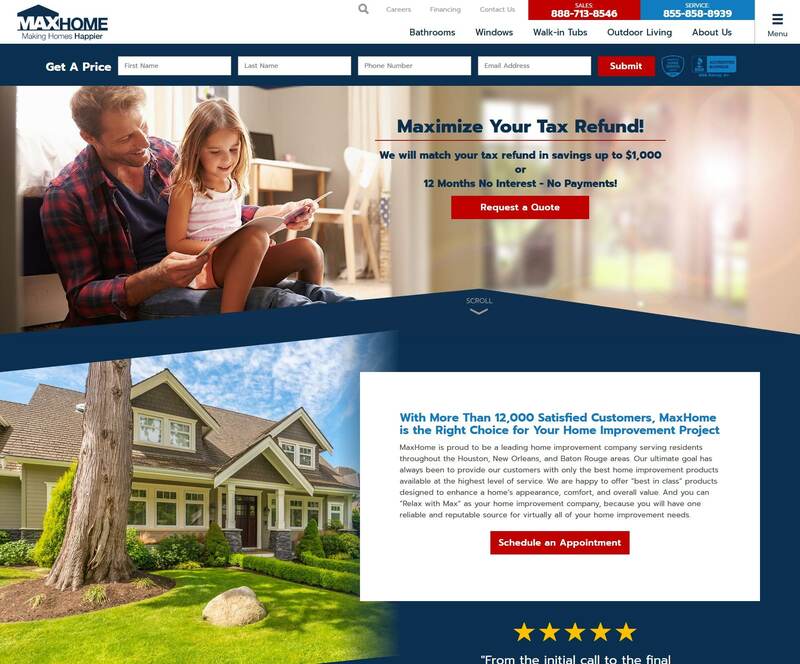 They showcase client testimonials on the homepage to build credibility. The use of stock photos is good on this website, they stay away from the cheesy hard hat style pictures. They have a simple contact form with a captcha to deter spam. Square Footage is a kitchen and bathroom remodeling company that also offers interior design services. The use of professional photos on this website is great. They have a unique homepage which emphasis their work in a masonry gallery style. They showcase their work in a simple way to engage interest in their services. Their 5 step process clearly shows what the experience is like working with them. This website has simple call to action and contact information is easily found. 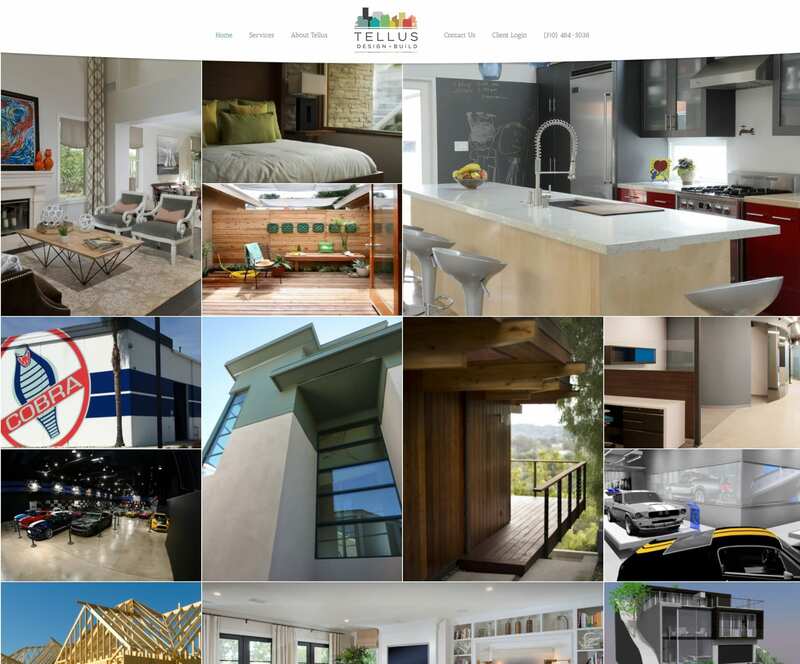 Tellus Design + Build is a great website. They did something unique but kept it simple to avoid confusion on how to use the website. 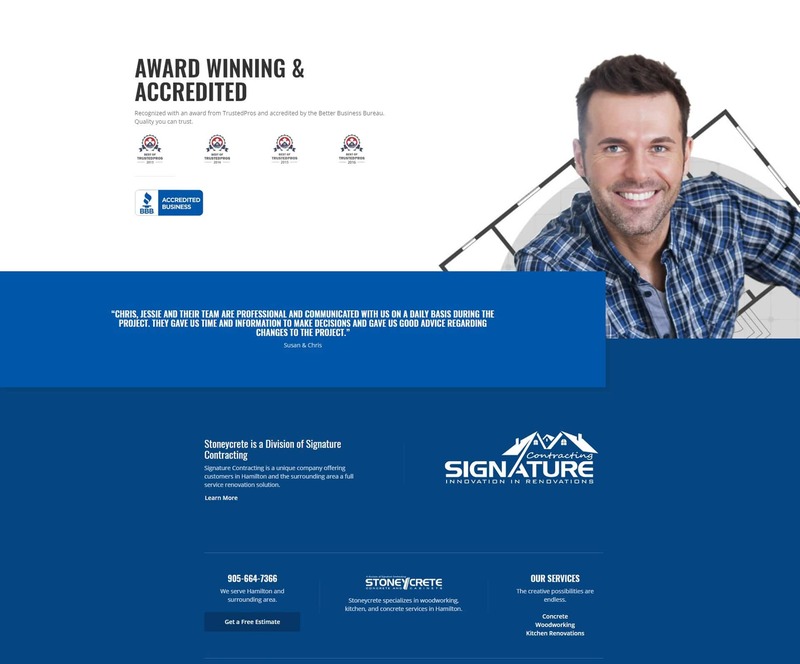 The masonry style homepage with animated hover effect is effective and engaging. Their use of professional photos to showcase their work is great. 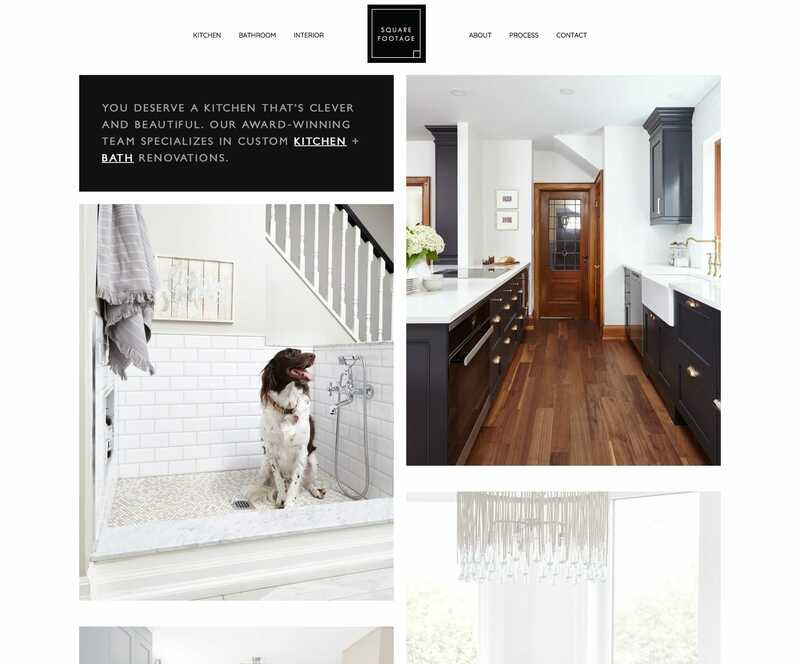 They emphasis their Houzz awards on pages which is great for credibility. The use of the brands colors and font styles on this website are perfect. The overall design is simple and modern yet it keeps you interested. Integrated client login with Builder Trend makes it easy for existing clients to login to their project management tool. MAX Home is a bathroom remodeling and windows company located in Texas and Louisiana. This website has great call to action with specials and financing offers throughout. This website has a live chat widget on all pages which makes it easy for visitors to contact them. They showcase their client reviews throughout the website to build credibility. This website has two phone numbers on the top of all pages. The onsite SEO for the website is done well with proper H tags and overall structure. 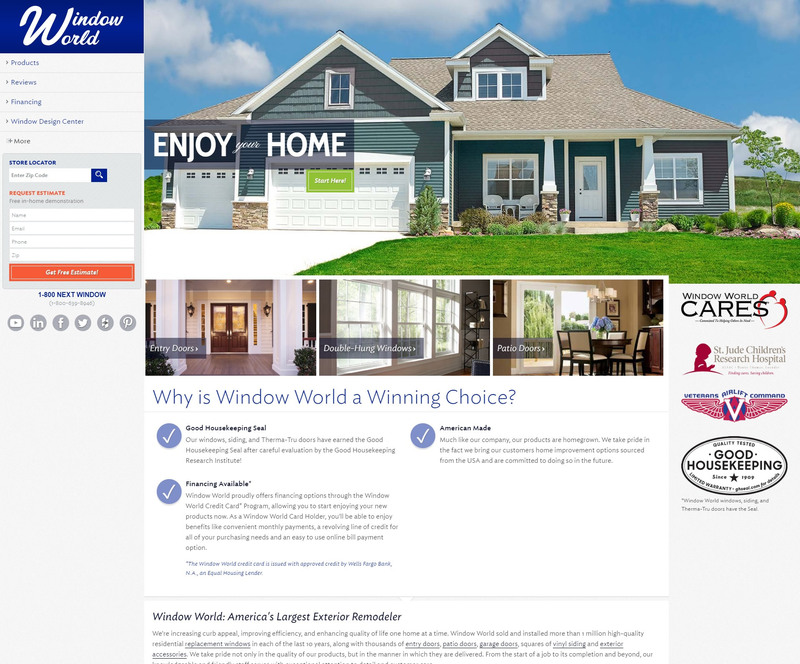 Window World is a national windows installation company. This website was built to produce leads. Strong call to action on all pages of the website. Financing and reviews in the main navigation. Simple zip code store locator makes it easy to find your local dealer. While the content structure of this website could be better, it most likely still generates leads at a good conversion rate. 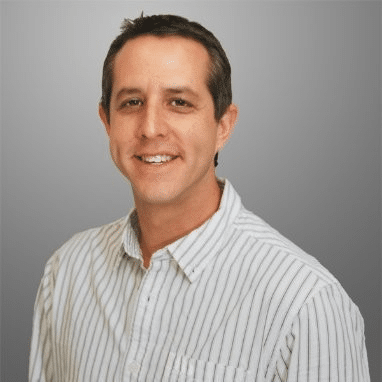 Website has strong SEO and good rankings on Google. North American Roofing is a commercial roofing contractor. The homepage of this website has a interesting interactive hereo slider. The use of their sticky navigation is great. The main nav always stays fixed on the top as you scroll down the pages. The website has strong call to action, with mutliple ways to get in touch with the company. They showcase their 40 year anniversary on the homepage which builds credibility. 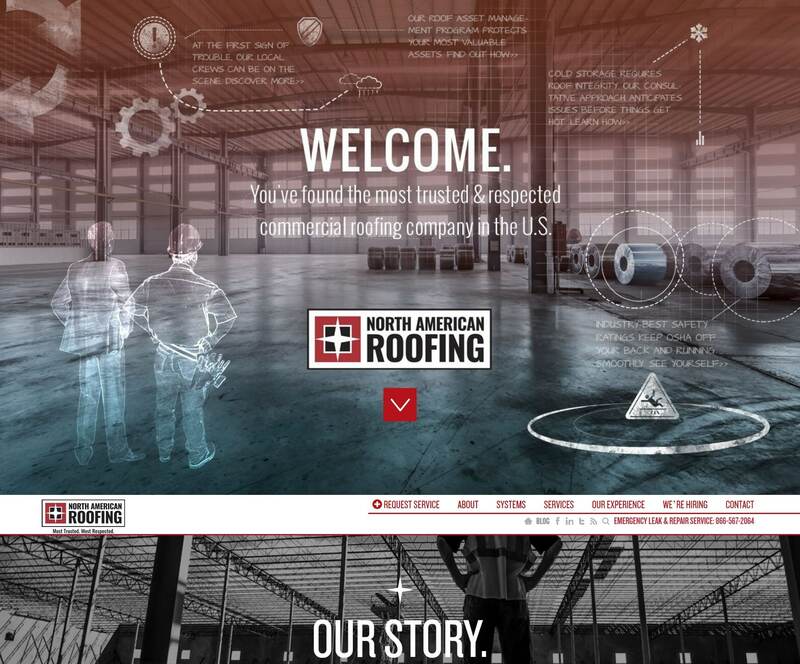 They have a great blog which is packed with content and information related to commercial roofing. The website has alot of information and is well structured to easily find what you;re looking for. McCarthy is a well know brand in the commercial construction industry. The video on the homepage is well done and really creates interest in the website. The use of a mega menu navigation is great for displaying the large amount of pages this website has. They showcase many popular brands they have worked with to build credibility. The call to action on this website could be stronger but they are most likely not lead focused since they are a bigger brand. The company timeline is a great feature of this website. It really shows who they are and the history of the business. If you would like to recommend a construction website to be added to the list please share it in the comments below.